One of the most significant conflicts spanning Europe and the Middle East, the Crusades led to the creation of a number of iconic medieval symbols and motifs. We carry a wide range of Crusades accessories and Crusades jewelry inspired by the various knightly orders and historical battles. Two of the most well-known orders, the Templars and the Hospitalers, are represented within these unique pieces. 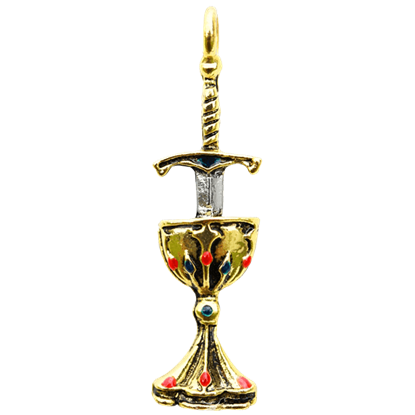 Our inventory includes a variety of Crusader necklaces, cross pendants, Templar signet rings, knight pin badges, medieval bracelets, and other items. These Crusading knight accessories are perfect for costumes, re-enactments, or gifts for history buffs. Browse our selection, and you are sure to find something of interest! 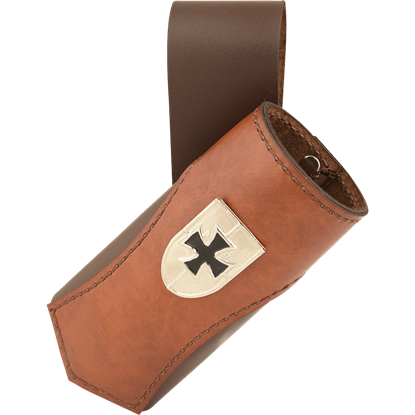 Our Knights belts are the perfect choice for almost any medieval knightly outfit. 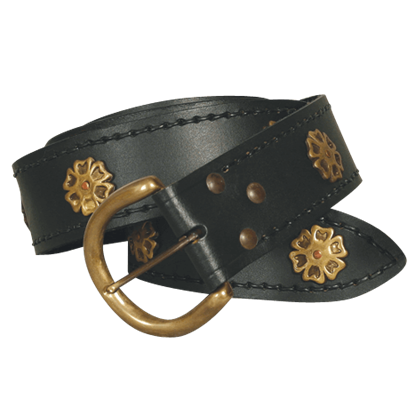 The extra long 70 inch heavy grade black leather belt is gorgeously accented with antiqued brass roses and heavy duty buckle. Our Knights belts are the perfect choice for almost any medieval knightly outfit. 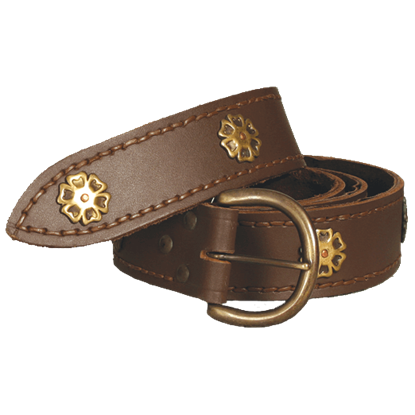 The extra long 70 inch heavy grade brown leather belt is gorgeously accented with antiqued brass roses and heavy duty buckle. The eagle is a heraldic bird, one that rules the sky and as such, symbolizes courage and determination worthy of the king. 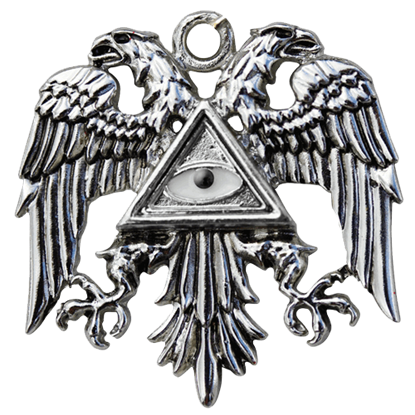 This Byzantine Eagle Templar Necklace merges that creature with the mystic symbols of the ancient knightly order. 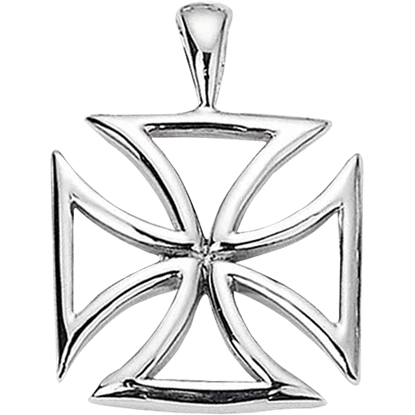 With multiple popular variations such as the firefighters Cross of St. Florian and the cross of the Order of St. Stephen, the Maltese Cross, like the one seen in the Crusader Maltese Cross Pendant, is instantly recognizable and widely popular! The Crusader Sword Frog is based on the iconography of holy warriors honor bound to their cause. This handmade leather frog features a Crusader shield concho on its front accent panel, adding medieval style to its versatile form. 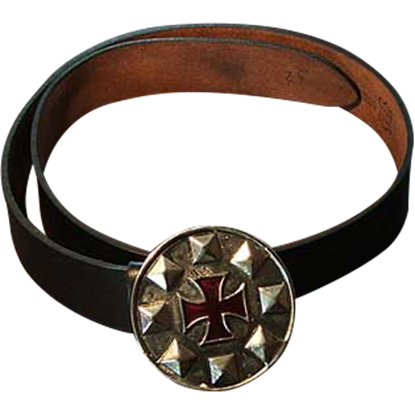 The Crusaders Cross Buckle Belt is an attractive belt and belt buckle combination that can add just the right knightly touch to virtually any look. It is great not only for modern looks but also for knightly and historical ones. 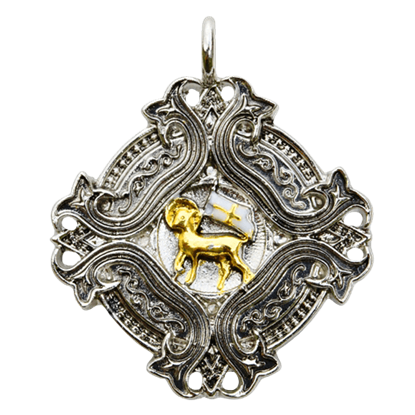 This heavy metal pendant takes the symbols of a crusader and transforms them into a wicked representation of medieval style. 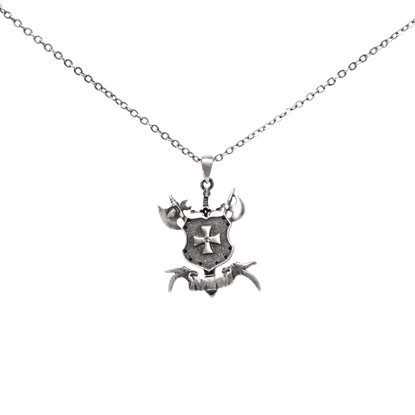 This Crusaders Cross Necklace is designed well enough that it can be worn with any outfit you own! 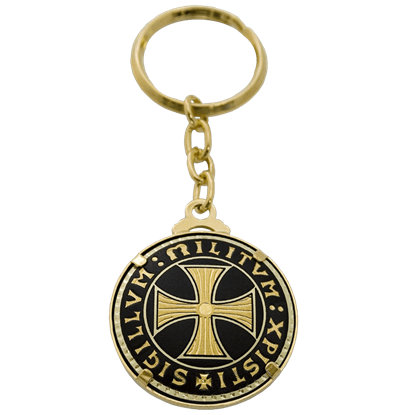 The Damascene Templar Cross Keychain by Marto is decorated with 24K gold damascene artwork on both sides, which depict not only a phrase key to the Knights Templar but also two of their most famous symbols. 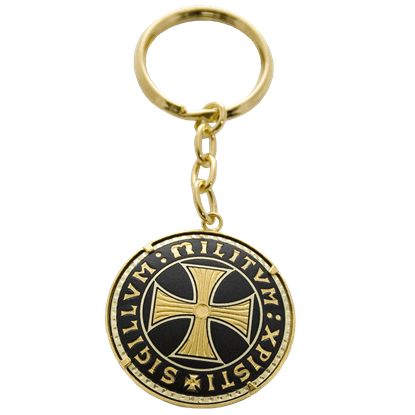 The Damascene Templar Cross Keychain by Marto is decorated with 24K gold damascene artwork on one side, which depicts not only a phrase key to the Knights Templar but also two of their most famous symbols. 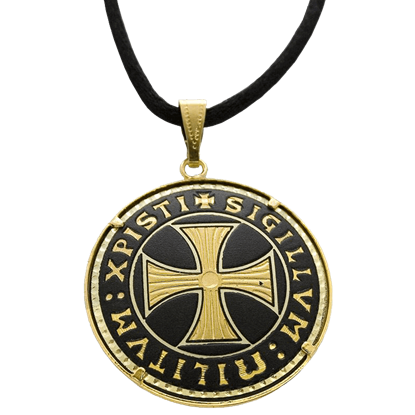 The Damascene Templar Necklace by Marto is decorated with 24K gold damascene artwork, which depict not only a phrase key to the Knights Templar but also two of their most famous symbols, depicted as lettering and a cross.